The pre-dawn light was sufficient for safe passage from the parking lot over a boardwalk to a beautiful stretch of beach on the Fort Morgan peninsula. The early arrival guaranteed our party, led by guide Matt Isbell, would get to pick the spot where our surf-fishing adventure would have the best chance of success. Isbell, better known as the Bama Beach Bum to all his YouTube followers, has developed a niche among fishing guides on the Alabama Gulf Coast. He has tried fishing from boats and piers, but he prefers the sandy beaches and surf where whiting and pompano roam. The Wetumpka native moved to Gulf Shores for an insurance job, but his surf-fishing success led to a full-time guide business in March of this year. “I started uploading YouTube videos in October last year and started guiding in December,” Isbell said. “I didn’t really plan on guiding. I started hosting online content just because I loved it, and I wanted to kind of see where it went. Isbell decided to see if anyone would pay for his services. He learned there is a growing market for his kind of fishing. “It kind of snowballed from there and really started picking up,” he said. Isbell soon found out his guide business appeals to a wide variety of customers. “Most of my clients are out-of-towners, a lot from the Midwest but from all over the country,” he said. “I’ve had a group from Guam that wanted to fish. They saw me on YouTube. Right now, I’m the only one uploading surf-fishing content to the internet, so that’s how some people find me. Isbell’s surf fishing started in earnest six years ago when he moved to the Alabama Gulf Coast. “When I first started surf fishing, I was just trying to figure out what to do,” he said. “Like a lot of people in Alabama, I grew up bass and crappie fishing. When I came down here, I just tried to figure out the fishing. I fished a lot of different ways – from boats, piers, canals, wherever I could access the water. Isbell has refined his surf-fishing techniques in the last six years. Although he has learned to judge the surf and which areas produce fish, it’s really not a technique that infrequent visitors should tackle. He said learning to read the beach takes time, that most people find it difficult to pick up on the nuances that might lead to better fishing unless a lot of time is spent on the beach. “The biggest thing I tell people to do is to stagger your baits,” he said. “Make sure you cover a lot of water and try to locate the zone those fish are running in. Especially when you’re surf fishing, these fish are not hanging in one area like they do on a reef or pier or jetty. The fish in the surf are always moving, looking for food. But they are going to hang in a particular depth. That’s why you stagger your baits to try to find out what depth those fish are favoring. But it can change daily or week to week. You always have to recalibrate to find the fish. Isbell said a dedicated surf angler will need a variety of tackle to target the species that happen to inhabit the surf at any given time because different fish come to the beaches at different times. On our trip, Isbell used 10-foot surf rods with 4000- and 5000-series spinning reels spooled with 20-pound-test braided line. Of the five rigs we used during our outing, we had a drop-hook rig with the 2- to 3-ounce weight tied to the bottom on three rods, while the other two were rigged with cut bait hooked below the weight (Carolina rig) to try to catch a redfish or bluefish. He uses 1/0 to 2/0 circle hooks most of the time. Isbell said probably his hardest job is teaching clients what to look for to indicate a bite. A rhythmic motion of the rod tip indicates wave action. A steady pull or erratic action means some species of fish is taking the bait. Although our party, which included Jay Hirschberg and Wayne Carman, was fishing on a neap tide, we managed to reel in bluefish, whiting (sometimes called southern or Gulf kingfish), a rodeo-worthy ladyfish and the ubiquitous hardhead catfish to the beach. Isbell said the heat has caused the pompano to vacate the surf until the weather and water cools. Cooler weather will also bring another desirable species close to the beach. “We get a good run of bull redfish in the fall,” Isbell said. “We will use a lot of cut bait. I’m transitioning now to using cut bait on Carolina rigs. If I’m fishing for bull reds, I’ll move up to a 4/0 hook. They will hit pompano rigs, and that’s definitely worth doing because the pompano fishing is only going to improve as the weather cools. For those who specifically target pompano in the surf, Isbell said the best fishing occurs in the spring. 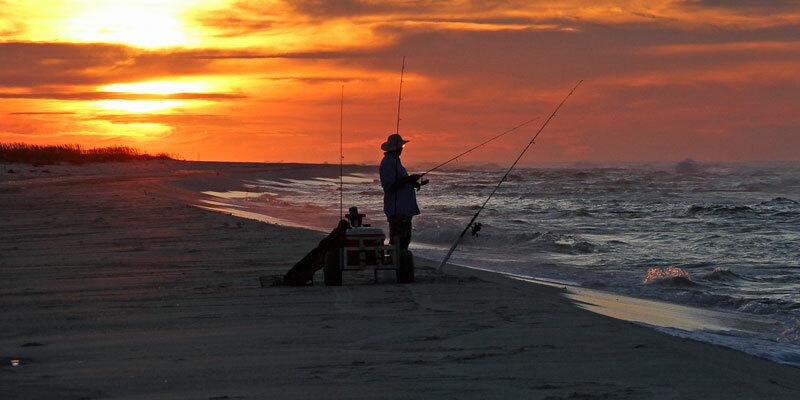 Isbell said certain conditions provide an opportunity to catch speckled trout in the surf as well. Go to this link for information on booking trips with Isbell as well as links to his Facebook and YouTube pages. Because his guide service is shore-based, anglers who fish with Isbell are required to have a valid Alabama saltwater fishing license in their possession. Visit this link for more information. David Rainer is an award-winning writer who has covered Alabama’s great outdoors for 25 years. The former outdoors editor at the Mobile Press-Register, he writes for Outdoor Alabama, the website of the Alabama Department of Conservation and Natural Resources.